I've been singing that Family Guy song in my head for the past 20 mins, gosh darnit! 1. I go to bed at 5am every day, and wake up around 1-2 pm. 2. Because of this, I eat breakfast at 2pm, lunch at 6pm, and dinner at 3am. 3. Needless to say, I'm a night owl. To the maxx. 4. I only wear black eyeliner, and on-the-spot Vichy medicated concealer. Sometimes I'll add mascara, and my YSL lipgloss. But only sometimes. 5. I like wearing really short skirts because they make my legs look a little fuller; since more thigh gets exposed it creates a nice curve. 6. I hate carrying bags/clutches when I go out dancing, because I tend to get into at least one dance off. Wicked moves just don't have as much of an effect when a bag is swinging off your shoulder, or a clutch hitting you in the face. I prefer my cell in one pocket and my money + id in the other. This is a pain when you don't have pockets, which for me, is most of the time. 4. Lanvin Jeanne perfume that I bought in France. 6. Polyvore sets by lovemejessy! 1. My knees, they always swell up after a day/night in heels or platforms. 2. The bruises I get from learning how to break dance. 4. Not being able to wear one pair of leggings without tights underneath them, because it's already so chilly here in Toronto. 6. The massive shortage of doctors around the world. 1. After all these weeks, and multiple auditions, I finally made it onto the competitive team for next month's hip hop competition [O.U.C.H]. I will be in the selected group representing our university at this event. I'm super excited, since this is my second year in this competition, but the road was much tougher this year. 2. I had a picture from France posted on my Flickr account, and it was chosen as one of the many shots representing Sète on Schmap. It was such a pleasant surprise. It's nothing glamorous or awe-worthy, but I just thought I'd share that with you. 3. 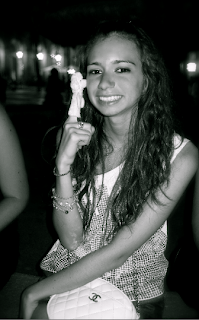 My bffl Kat has this finger puppet of a white poodle that she carries with her EVERYWHERE, in her purse obviously, so she can take funny shots with him. Needless to say, Bubbles [the puppet] has been all over Europe and Toronto with us. Alex Gaudino even snapped a picture with him when he was dj-ing at La Dune, in Montpellier, France. 4. 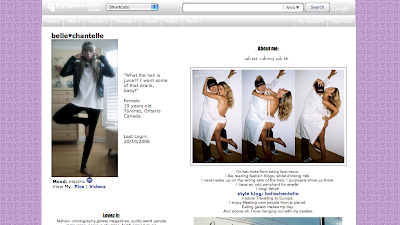 I made a new myspace layout [I'm never on it, but it was looking bland]! And I'm super excited over it, because it took me forever to find the codes to get rid of the pre-made junk that was already there. *sigh* So worth it. I tried opening it on my PC but it looked funky, on my Mac it looks fine. If you're bored, go take a lookers because I put up tonnes of cool& quirky photography! 5. 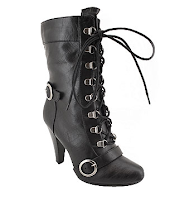 And LASTLY, I ended up buying a pair of boots on gojane.com. This is an incredible feat as I've never purchased anything of this sort online, only textbooks. I hope they fit! Wish me luck! Alrighty, I think that is all. I was going to have a post on what I wore today as well, but lo and behold, I looked pretty put-together when I left the house, and I returned looking like a wet monkey. I hate being stuck in the rain with no umbrella, moping about an exam I just finished. "I go to bed at 5am every day, and walk up around 1-2 pm." Ahah the Karl Lagerfeld ! i loved finding out these little facts. and ok- you must divuldge what do you do where you go to bed @ 5 ? I wake up at around 6-630am...just after you fall asleep. I can't imagine...my body would go into shock. i hope you're having a fabulous week. Karl is hysterically fabulous as are your new boots, and congrats on your achievement! Awwww awesome stuff you've chosen. Want it all! i'm addicted to facebook and Text messaging too! I love the photos that you added. But I like that photo with the boat! im addicted to facebook too and im a nighthawk. I cant believe your schedual its insane but so cool! how much was your total gojane purchase i thought about buying from there but the s&h worried me. The Lagerfelt finger puppet is totally cute! Good luck, I wanted to buy those shoes to but I guess I didn't dare. Wow, thanks for the comment, so sweet of you! Still have some tech-work to do on my blog, put hope you found you way. I really like your blog too (I put you in my blogroll as well as bloglovin), you have some great outfits ;) I'm in the middle of moving but I wanna start posting outfits as well once I get settled in, hehe. Great and beautiful post, dear! haha Lagerfelt. I love it. Your flickr photo is amazing. went to a measly low. not cool. so i hope they fit! jealous! 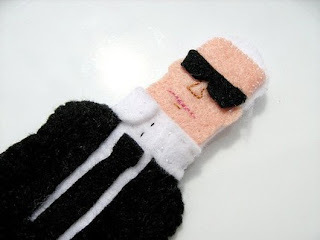 OMG the karl felt is SO SO SO SO SO cute!!!! 5am !?!?! woah... I thought I was bad with 3am.... haha. well, I just found your blog, and I am already in love with it. facebook for me is by far my downfall XD I spend way too much time on it. 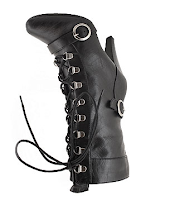 love the boots, I almost got them myself, let me know how they fit;) great blog!! wow girl! you are a night owl!